Domestication of the chicken dates back to at least 2000 B.C. and their ancestry can be traced back to four species of wild jungle fowl from Southeast Asia. However, the Red jungle fowl (Gallus gallus or Gallus bankiva) is the most commonly found wild species in the world today and is considered the main ancestor of the domestic chicken. The chicken belongs to the genus Gallus of the family Phasianidae. Domestic chickens are simply classified as Gallus domesticus. The sport of cockfighting had tremendous influence not only in the domestication of the chicken but also on the distribution of fowl throughout the world. After centuries of selection and breeding for numerous extremes, chickens now exist in many colors, sizes and shapes. There are more than 350 combinations of physical features known today. In 1873, the American Poultry Association was organized for the purposes of adopting standards of excellence and establishing a way of classifying the various breeds. 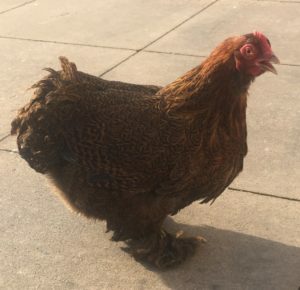 Although the purebred poultry industry served as the foundation for the development of the commercial industry, the two industries soon developed very different types of domestic fowl. While the purebred exhibition industry continued to select and breed fowl for standard conformations and plumage colors, the commercial industry developed specialized hybrids for meat and egg production. Today, the two industries are very different. The purebred fowl of today are basically the same as they were 100 years ago and are mainly raised as a hobby; whereas, the commercial poultry industry has developed into a science, which produces highly nutritious meat and eggs with extreme efficiency.